We had our Memorial Day grill fest on Sunday instead of Monday and we had my favorite, burgers. Once again I served them in my semi-roll style. When eating this you flip it over so the roll is on the bottom and the lettuce is on the top. Easy to hold, tastes like the real thing, and saves probably one hundred calories. Also made up some more Texas caviar but this time with fresh tomatoes, black-eyed peas, and a cayenne chile for some extra spice! 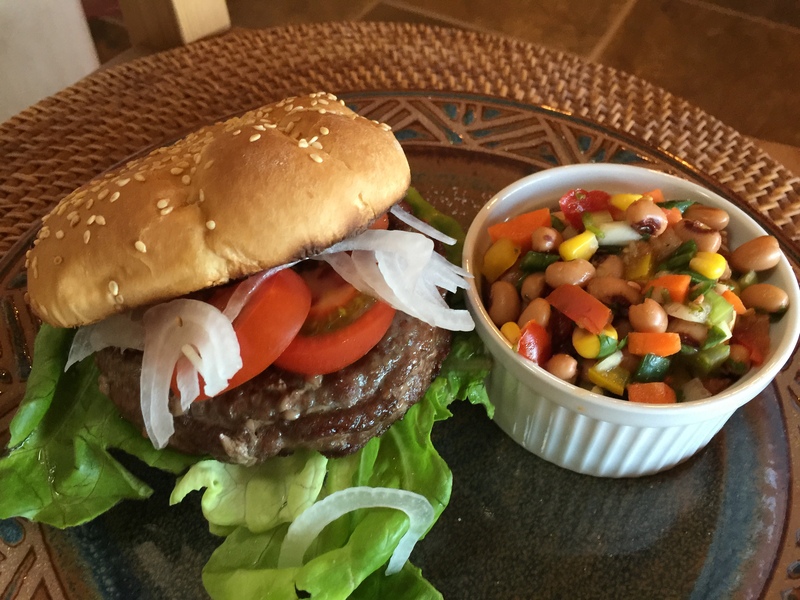 This entry was posted in Beef, Healthy tips, Legumes, Vegetables and tagged bell pepper, black eyed peas, Burger, carrots, Celery, corn, garlic, ground beef, lettuce, Onions, Salad, tomatoes, Vegetables. Bookmark the permalink.